When it comes to the Bay Area’s hidden outdoor treasures, our local tide pools are comparable to some of the best around the world. With a little advance planning, you can pay a visit an ecosystem teeming with marine life and get up close and personal with beautiful sea creatures that only low tides reveal. You want to hit your destination at a zero or negative low tide. (“Zero” is the average low point, and a negative or “minus” tide is an unusually low tide that occurs around the full and new moons.) You’ll get plenty of tide-pool action during a regular, zero tide, but extra-low negative tide reveals more of the rocks that are normally covered with water, and more creatures that are usually submerged. To get the timing right, be sure to check a tide table before you go, either the NOAA or Saltwatertides. Accessible via a short trail off of Elm Road in Bolinas in West Marin, Agate Beach, located about 30 miles or an hour’s drive northwest from San Francisco, has a huge stretch of tide pools as well as great bird watching. Duxbury Reef is a soft shale reef – the largest in California – and is part of the Gulf of the Farallones National Marine Sanctuary. Together the reef and the beach are among the most biologically diverse coastal areas in the Bay Area. Go during a very low tide and you might see a bat sea star, an unusual kind of sea star that has webbing between its arms, or a giant green anemone (rumor has it that at this location, specimens of the latter can measure six inches across!) Bonus: On a clear day you can get a great view of the Farallon Islands. You’ll find Pigeon Point’s tide pools about 100 yards or so north of the hostel building at Pigeon Point, located about 50 miles or an hour’s drive south of San Francisco. And they’re chock full of anemones, crabs, abalone and mussels. If you’re there between March and May, you might see migrating whales as well, and Año Nuevo State Reserve, where you can catch elephant seals and their pups in the winter, is right nearby. Bonus: The inside of the Pigeon Point lighthouse is closed to the public, but it’s still worth seeing from the outside – at 115 feet, it’s one of the tallest lighthouses in America. The lighthouse keeper’s lodging has been renovated and operates as a hostel, making an overnight stay an option! If you’d like a guided tour of tide pool beauties, check out Fitzgerald Marine Reserve in Moss Beach, where volunteer docents can introduce you to some of the 200 species of animals and 150 species of plants that make their home in the reserve’s tide pools. While you’ll never be guaranteed a sighting of an elusive red octopus, chances of seeing one at the reserve are better than elsewhere. 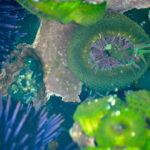 Each ecosystem is different and therefore is home to a different array of creatures, but in general, here’s what you can keep an eye out for in the Bay Area’s tide pools: barnacles, sea anemones, sea stars, sea urchins, mossy chitons (a type of mollusk), skates, coralline algae, pebble crabs, turquoise sculpins (a bottom dwelling fish), mussels, broken-back shrimp, sea cucumbers, iridescent algae, sea grapes (a type of seaweed), iridescent algae, and if you’re super lucky, red octopi. Bonus: 126 species of gastropods (snails) live in the reserve’s tide pools. How many can you find? Check out this in-depth video about the wonders of Fitzgerald Marin Reserve, by Quest’s Joshua Cassidy. Bring warm clothes and closed-toe shoes (leave your flip flops at home — those in the know recommend old sneakers or even rain boots). Remember that creatures in tide pools are for looking at, not prodding at or even touching at all. 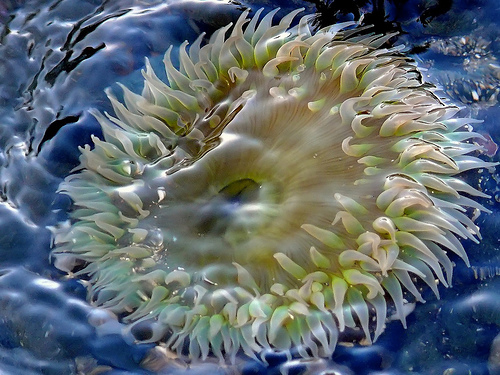 Even though they’re battered by waves on a daily basis, tide pool organisms are in fact very delicate and vulnerable to disturbance by humans. One well-meaning, curious poke from you could mean death for a tide pool inhabitant. Consider buying a field guide. Pacific Intertidal Life: A Guide to Organisms of Rocky Reefs and Tide Pools of the Pacific Coast by Ron Russo and Pam Olhausen is inexpensive and comes highly recommended. A more expensive option is The Beachcomber’s Guide to Seashore Life of California, by J. Duane Sept.
Plan to arrive at the tide pool at least 30 minutes before low tide so you have time to explore before the tide starts coming back in. 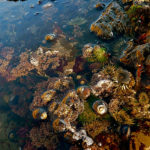 For more about exploring tidepools in the Santa Cruz area, check out Science Hikes on KQED’s Quest. Prev Tour the Globe in Your Own Backyard Next 6 Ways to Escape the Fog in Less Than an Hour!